Currently, Mamet Kurkchi is in the police station. Early in the morning occupants searched the house of a Crimean Tatar Mamet Kurkchi, residing in the village of Uch-Kuyu (Vostochne) of the Soviet region, according to the first Deputy Chairman of the Mejlis of the Crimean Tatar people Nariman Dzhelalov. “Today at six in the morning, house of the Crimean Tartar Kurkchi Mamet was searched in the village of Uch-Kuyu (Vostochne) of the Soviet region of the Crimea. As of now, local police officers have brought him to the District Department,” he wrote. Dzhelalov specified that activists are now trying to find out the reasons for the search. Reference: Following the Russian annexation in the Crimea, mass searches of independent journalists, Crimean Tatar activists and members of the Mejlis have increased. On international platforms, human rights defenders regularly report on violations of human rights on the peninsula. The so-called "Hizb ut-Tahrir" has become a "hallmark" of the FSB struggle against dissenting Muslims. 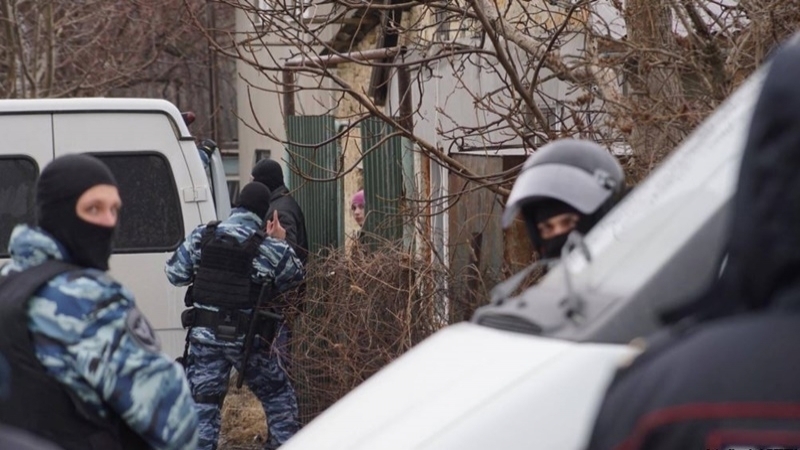 Under the pretext of suspicions in terrorism, calling their repressive actions a fight against extremism, Russian security forces break into homes, carry out massive illegal searches and detentions.